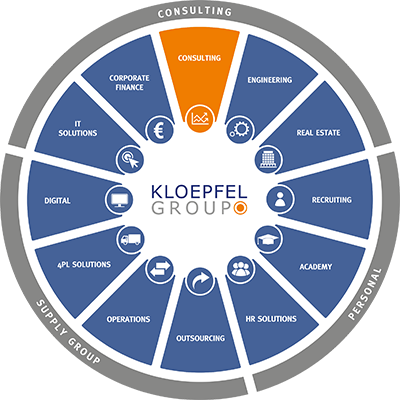 Purchasing Consultancy Kloepfel Consulting optimizes procurement and production costs from SME’s. The implementation-oriented multinational consulting firm can be measured by the success of its projects. Of course Kloepfel Consulting concentrates one hundred percent on each individual client company. For example, it is customary for the teams of consultants to work at the customer’s premises. The consultants see themselves as coaches and temporary colleagues. The aim of the projects is to make the companies, the competitiveness of the products, purchasing and thus the supply and value chain fit for the future. Are you looking for a purchasing expert who not only shows potential, but also implements it in a team with your employees and suppliers? We are experienced in the industry, pragmatic and down-to-earth. Our salary is 100% based on the achieved success, i.e. no savings – no fee. Over 700 companies have already benefited from our entrepreneurial and collaborative approach. Stress and lack of time in day-to-day business are at the expense of productivity, motivation and return on investment. Our purchasing structure experts relieve you of this stress and ensure that your purchasing department is integrated into all processes at an early stage and becomes transparent. With our optimization of your purchasing structure you gain significantly in efficiency. You gain more time for strategic purchasing and your core suppliers. This brings savings of at least 5% on your total purchasing volume. In this process, customers are not convinced by extensive analyzes and large strategy papers – nor does Kloepfel Consulting sell consulting concepts “off the peg”. At Kloepfel we work rather pragmatically and result-oriented with fast results that can be measured at any time. We are so confident in our concepts that we are paid 100% success-oriented. Within the projects, the customer can follow every step of the Kloepfel teams exactly and always has control over the project. It is also common for the Kloepfel teams to inform the customer before each negotiation step and to adjust these together with the customer. It is important for Kloepfel consultants to strengthen purchasing internally as well. The customer’s know-how is combined with proven international management experience. The interdisciplinary management consultants from merchants and engineers have consulting experience from companies in a wide range of industries. With local partners in America, Asia and Eastern Europe, the cost optimizers offer their customers a truly global pool of knowledge.